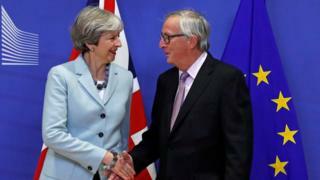 Friday's handshake in Brussels between Theresa May and Jean-Claude Juncker is the image on many of Saturday's front pages. The Daily Mail calls it historic, saying it sealed a vital step in the UK's departure from the EU. "Britain took a huge step toward regaining control of its borders, laws and money", it says. The Daily Express says Mrs May clinched a deal, "now let's get on with ditching the EU", whilst for the Sun, it was a "champagne Brexfast" in Brussels, and one in the eye for the Brexit doom-mongers. The Times thinks a "rejuvenated" Mrs May will now seek to exploit the momentum of her success by confronting Boris Johnson over his vision for Brexit. The Daily Telegraph agrees her stamina and doggedness should be recognised and the Daily Mail's columnist, Peter Oborne, says that "Lazarus-like, Theresa May is back from the dead". But the Daily Mirror labels her Mrs Softee, saying: "She has been forced to cross every one of her own red lines." And the Irish Times is dismissive of the idea that the prime minister has been a shrewd operator. It says: "Brexit is not a negotiation, it turns out, but a slow march towards British acceptance of the weakness of its own negotiating position." The Guardian warns that battle will now commence in the cabinet over the shape of a final deal, and one of its members - the Environment Secretary, Michael Gove - has his say in the Daily Telegraph. His article welcomes the deal, but he adds that if the British people dislike the arrangement, they can choose a government in the future which will follow a different path. The Politics Home website accepts that Mrs May has snatched some respite from the jaws of seeming defeat, but thinks the deal has simply "kicked the can down the road". It concludes: "To consider this document as an answer to that most vexatious of questions, that of Ireland, would be wrong". The Financial Times says any triumph for the prime minister was "blunted" by warnings from the EU about the tough choices ahead, as well as the lack of time in which to make them. The husband of Nazanin Zaghari-Ratcliffe tells the Guardian that he is "biting his nails" ahead of Boris Johnson's arrival in Iran to lobby for her release. Richard Ratcliffe had asked to accompany the foreign secretary to Tehran, where his wife is in jail on spying charges which she denies. But he says it is better that Mr Johnson is there now, ahead of an imminent court appearance. Mr Ratcliffe's parents, John and Barbara, tell the Daily Telegraph they are terrified a new trial could lead to a longer sentence. "There's a part of me saying Nazanin is going to be home by Christmas," says Mrs Ratcliffe. "The only way we can move forward is by hoping all the time". The Daily Mail reports that the Archbishop of Canterbury, Justin Welby, has criticised grammar schools, warning that they are against "the common good". Speaking in the House of Lords, he said the children of privilege were continuing to inherit privilege. The Conservative MP Conor Burns tells the paper that perhaps the Archbishop is "reflecting his age". He says grammar schools provide opportunities for both rich and poor children.